The drive south from Seattle was fast and easy. Temperatures were mostly reasonable although we did have one morning in Burley, ID when we saw 40 F. Too cold for us! 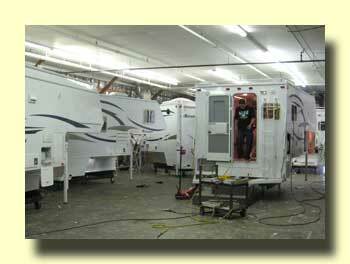 We have two RVs. One is a Bigfoot Class C, the other an Adventurer truck camper on a diesel Chevrolet pickup. We've been big fans of the Adventurer campers for many years. The one we have now is our second. 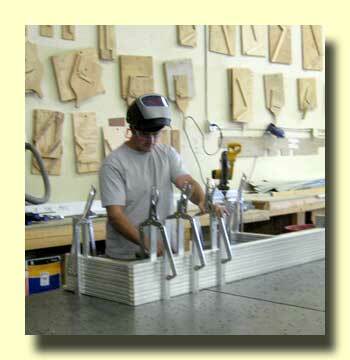 We find them to be extremely reliable and the designs are very well thought out. 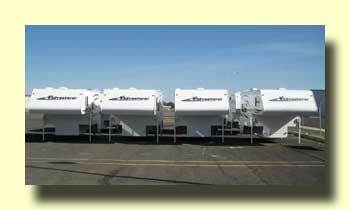 We attribute this to the fact that many of them are built for Fraserway RV, one of the largest RV rental operations in Canada. 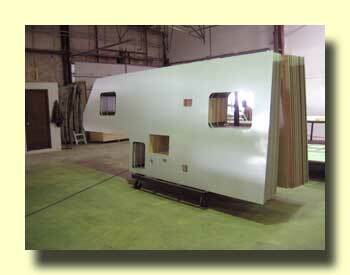 Fraserway's owners also own Adventurer, and they really know how to build a bulletproof camper. Most RV manufacturers only see their products in the beginning when owners bring them back to get the manufacturing defects cured. Adventurer and Fraserway see the rigs they build throughout their operationg life, they know what works and what doesn't. 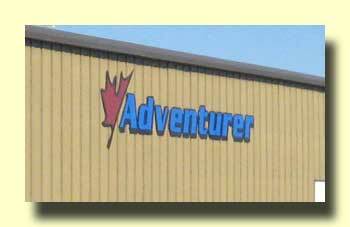 The Adventurer factory is in Yakima, Washinton. At the Snowbird show we received an invitation to visit and we couldn't pass it up. There are pictures below. Utah's Dead Horse Point State Campground has always been one of our favorite places. 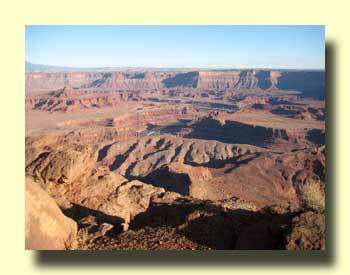 It's situated on a mesa top and overlooks the Needles District of Canyonlands National Park. We were coming in to Moab without reservations and decided to pick up the cell phone and give the park a call. The ranger said we were the third call that afternoon for the one site left, the first to arrive would get the spot. We took the chance and won the race. The big news at Deadhorse is that they've finally installed real electrical hookups. Formerly ther were low amp outlets at the picknick tables and nothing for the RVs. Now there are real RV-style pedestals complete with 50, 30, and 20-amp outlets. We arrived in Farmington a few days early. Friends greeted us at the Walmart lot and we decided to spend the next day visiting Chaco Canyon. 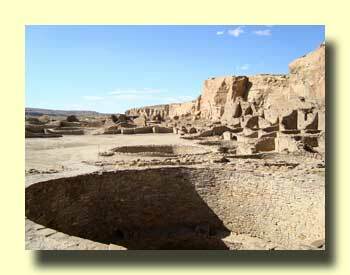 Chaco Culture National Historical Park is one of the premier Southwest ancient puebloan sites. 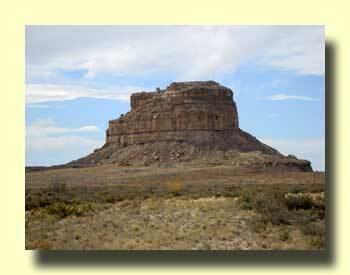 It's a shallow canyon about ten miles long and a mile wide with several large ruins. Many of the current puebloan peoples have connections with the Chaco culture. For visitors access to the canyon is difficult. There are no paved roads and the two dirt access roads aren't great. The best of the two is the one from the northeast, you only have to drive about 13 miles of unpaved road. 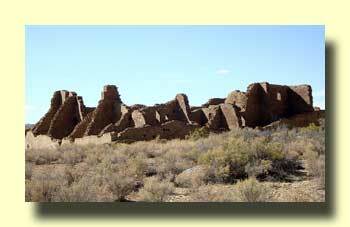 Chaco Canyon does have a campground. 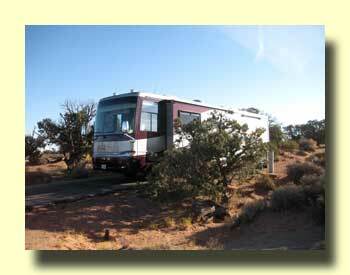 For information see our book Southwest Camping Destinations.